When your ancestor goes into bad place (yoni) or any his lust is remaining or he did not get salvation or any lack in his funeral or ancestor was upset by his son or he is in hell and desires of his own salvation, then this appears as a Pitri Defect(dosh) in Son's horoscope. This defect is called Pitra defect or dosh. Priest tells about this Pitri defect by looking into the person horoscope. Then person do some measures for peace of his ancestor or fulfill his left desire, so that his ancestor can get salvation. After that, his ancestor gets salvation and that person lives a happy life. If son serves his father-mother when they are alive then there will be no Pitri Defect. Here, we are telling you some yoga and their measures. 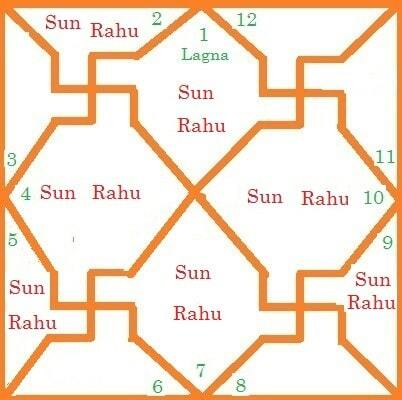 Yoga: When Sun and Rahu sit together in horoscope at first(lagna) house or second, fourth, fifth, seventh, ninth or tenth house as shown in the below image then there is Piri defect(dosh) in person horoscope. When owner of first(lagna) house is affected by Rahu-Ketu then Pitri defect is in horoscope. When owner of tenth house is in eighth house and having viewed by Rahu then Pitri defect is in horoscope. 1 : You should not sleep with feet towards south direction. Please keep your ancestor picture that side and donate or feed someone on their memorial date. 2 : Please feed food to Brahmins for your ancestors and give them some money, cloth and food to make ancestors happy. 3 : Please offer buttermilk, sugar and rice on people tree for your ancestors and do parikrama. 4 : Please do chanting of Pitri Gayatri Mantra one lakh and twenty five thousand times or get it done by Brahmin. From this, our ancestors will be happy. 5 : Please do chanting of Gayatri Mantra one lakh and twenty five thousand times to get rid of pitri dosh. 6 : Your ancestors will get salvation by doing chanting of Narayan Kavach. 7 : Go to Gaya, Pehawa, Pindark, Haridwar and Kurukshetra and donate dough (Pind) for your ancestors. From this, they will be happy. 8 : On each moonless day, please bath in Yamuna river. Through this, the effect of Pitri dosh will be over. 9 : Feed food to cow, crow and dogs for your ancestors. 10 : Please do worship of your family's God or Goddess for peace of your ancestors. 11 : Please give honor to your sisters, girls and Father's sister to make your ancestor happy. 12 : Please do snake-worship and feed food to Brahmin to make your ancestor happy.